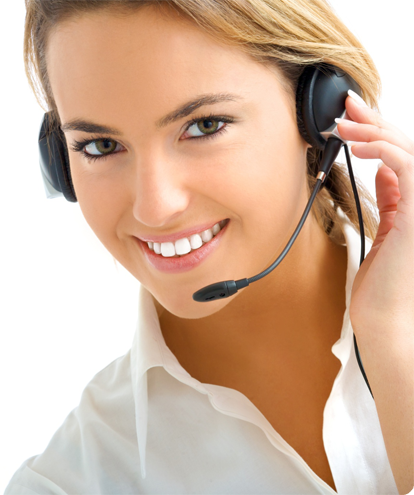 Do not hesitate to ask us a question - call or email us, we will respond to all of your questions! 1. What is so special about our product? 2. What kind of technology is used to produce our pools? 3. Is the concrete slab necessary at the bottom? 4. How big should the pit be? 5. How often should filter contents be changed? 6. How big should the machinery shed be? 7. Are our swimming pools tempered? 8. What is the warranty period for other parts of equipment? 9. Is any additional insulation necessary? 10. What is a broad technical edge for? 11. Do the pools possess a bottom gravity drain? Is it necessary? 12. Can the PoolsFactory Group install additional items of equipment in a pool basin? 13. What kind of equipment is necessary to unload a pool? 15. What is the monthly cost of pool maintenance? 16. How often should water in a pool be replaced? 17. How to prepare a pool for a winter season? 18. What is the max. temperature that water in a pool can be heated to? 19. 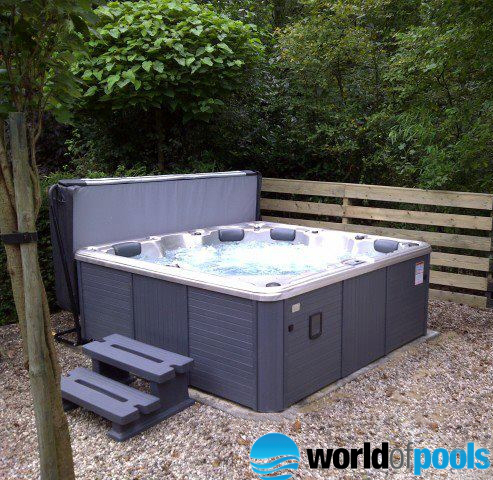 What are the main advantages of a polyester pool? 20. Which basin colours are available? 21. Is a non-return valve necessary? 22. Does the whole machinery have to be placed behind the pool? 23. Is it possible to fix a pool basin? 24. Do I have to empty the whole basin in order to change a light bulb? 25. How can the sand be poured into the filtration? 26. Where can I find installation guide for all the equipment elements? 27. Why is the water in my swimming pool green? 28. How can I empty a pool basin? 29. At what temperature does the heat pump turn off? 30. How should the heat pump be installed? 31. Where exactly should the heat pump be placed? 32. What is the purpose of solar foil? 33. How can I keep my swimming pool clean? 34. How does the filtration system function? 35. How long should the filtration device work on a daily basis? In the manufacturing process we use only first class materials, as well as state-of-the-art technologies. In order to sustain a top quality, we oversee the whole process of production from the very beginning. All the aforementioned factors contribute to the satisfaction of our clients and high position on the market for many years now. The highest quality of our pools has been certified by several acclaimed institutions in this field. Our pools are produced from high quality materials provided by Ashland company (www.ashland.com) and manufactured by the state-of-the-art machinery from GRACO company (www.graco.com). All the products from PoolsFactory Group are made of top quality certified materials that are licensed all over the world, even in the most rigorous food industry. From these materials such products like: containers for drinking water, small water ponds, yachts, airplanes etc. are made. Products made from unsaturated polyester resins possess mostly the gelcoat layer. It is the gelcoat layer that has the most impact on the quality of the final product. The quality of gelcoat contributes to the product aesthetics at the time of purchase as well as during its exploitation. The gelcoat resistance to aging, atmospheric and abrasive factors, scratching and to mechanical damage, substantially determines the durability of the product. We cannot forget about the protective role of the gelcoat which conserves the laminate against harmful external factors. This is the most important layer which in 60% of cases determines the quality of a final product. The even and uniform distribution of gelcoat is possible only thanks to the specialized machinery which our company has invested in to get 100% satisfaction in quality. The next layer in a row consists of isophthalic resin which is applied on a powdery fiberglass mat of the weight of 300 microns. The layer provides additional protection against water penetration into the next layers. The load-bearing layer made from a top quality constructional resin ensures the durability and stiffness of a product. If blended with a fiberglass mat, it gives extraordinary durability that in some cases may even surpass metal features. Fiberglass may take the form of a mat, fiberglass fabric or a bundle of fibers applied with resin and hardener direct onto the product (so called rowing technology). German Wolfangel is the leading company in this branch, that is why we use their machinery in order to get 100% satisfaction in quality. The bottom concrete slab is a necessary element before placing any swimming pool basin because it insulates and protects pools against unstable grounds, microvibrations and landslides. Stable grounds should be covered with the reinforced foundation concrete slab of the thickness ranking between 12-20 cm. Dimensions of the concrete slab correspond with external dimensions of the upper edges of a given swimming pool model. Concrete class should be B20. The concrete should be reinforced by a grid made of Ø8 – Ø12 ribbed rods with a gap every 20 cm. Reinforcing steel AIII (34GS). The durability of a swimming pool depends strictly on the proper preparation of the ground. The pit for a swimming pool should be ca. 40 cm wider than external upper edges of the pool. Filter contents should be changed at least once every two years. The machinery shed should be at least 1.0m x 1.5m x 1.5m for a basic set. It is also possible to order ready filtration boxes in our company. Tempering is a process of hardening materials, but it doesn't apply to products made from fiberglass or resin. Our pools aren't hardened by a traditional tempering method which is why the material is more flexible and resistant to fractures. For other parts of equipment there is a warranty period of 24 months, for light bulbs in lamps – 6 months. If the assembly/placement of a pool is carried out strictly according to the installation guide, the additional insulation is not necessary. Technical edge provides additional stiffening of the whole construction. It reinforces a pool basin and plays a considerable part during loading, transportation, and unloading when a pool is subject to the most damage. However, the edge is not part of the pool after placing the basin in a pool pit, that is why it can simply be cut off. What is more, scratching marks or any other signs of damage cannot be subject to complaint since the warranty does not involve the technical edges. Bottom gravity drain is not a standard feature of our pools. Of course, we can install the system on specific customer request. However, it is not necessary because in order to empty a pool, any kind of submersible pump is enough, and the right directing of the circulation nozzles ensures movements in the lower parts of water. Yes, they can be installed but it is extra paid. Some kind of a lifting device (crane) with a reach of at least 12 m is necessary to unload a pool basin. The basin should be hung on four ropes attached to the basin's edges. This way the basin can be safely unloaded without damaging its surface. At least two people are needed to secure the unloading of the basin, and a crane driver. Crane's slings must be at least 6-8 m long to prevent the squeeze and, as a result, fractures in the basin's construction. Any damages caused by too short sling cannot be subject to complaint (every unloading process is thoroughly photographed by our drivers). Delivery time is always arranged individually with a client. The minimum waiting period takes usually around two weeks. However, some pool models are available on stock so in these cases the waiting period can be shorten to just a few days. The monthly cost of a pool maintenance depends mostly on the purchase of swimming pool chemicals and energy consumption needed to run the whole installation. 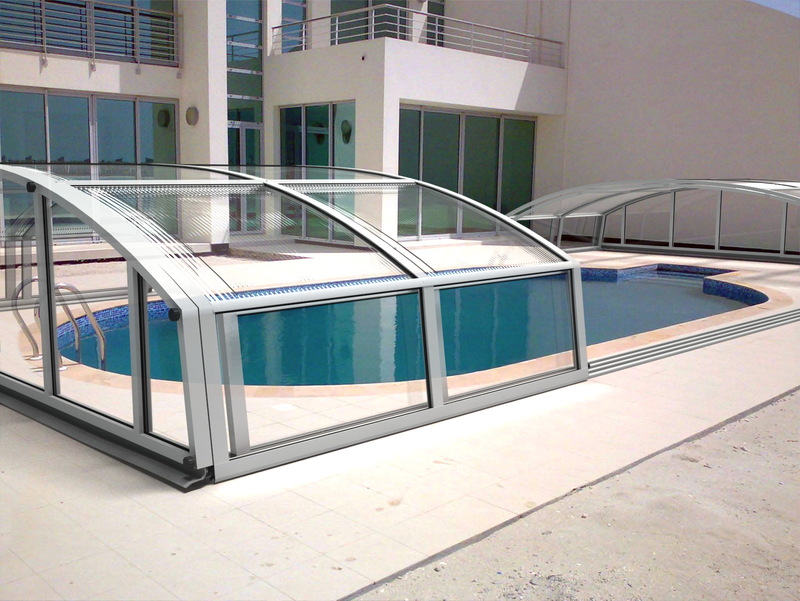 The costs vary according to pools' equipment and dimensions ranging from 50 to 200 €. A pool should be emptied and water replaced before the beginning of each bathing season. It should be noted, that for a winter season the water must be infused with a special winter preservative agent, and the water level must be sustained below nozzles. Water in a pool can be heated up to 28°C. A polyester pool is the easiest and the cheapest way to have a recreational pool at home. Polyester pools match concrete or steel pools when it comes to durability. What is more, they are easy to maintain and preserve – smooth inner surface makes the cleaning very easy. Basins are available in 4 different colors and diverse shapes. The altogether installation of a swimming pool takes approximately 5 days. 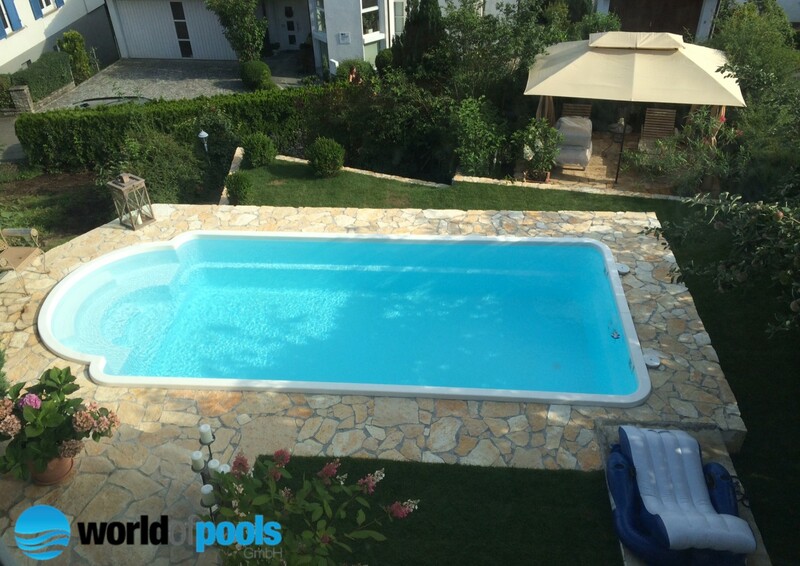 Pools come in 4 standard colours (white, blue, sand, grey). Any other colour available on RAL range of colours are also possible but they must be extra ordered and paid. It is necessary when the filtration device is situated above the water surface. It would be the best choice. The further from the pool, the more powerful filtration pump is necessary. In case of any damage that is subject to warranty, we ensure the repair and total removal of damage. Pool lamps are designed in a way that emptying the whole basin is not necessary to change a light bulb. In order to do so, the protecting glass must be removed above the water surface and then the light bulb can be changed. The sand must be poured according to the instructions, pouring from the most granular sand at the bottom to the finest at the top making sure that no sand grains get into the central pipe inside the filter. Green water is an outcome of algal growth. Algae develop in waters that are not disinfected in a right way. If the water temperature is lower than 24°C, it is advised to follow the instructions included with the anti-algae agent, if the water temperature is higher than 27°C, the dose should be doubled. All the chemicals agents should be applied regardless of the pool's usage. It can be done by turning the valve on the filtration device on “ODPŁYW” position (“WASTE”). Remaining water can be pumped by a submersible pump or a bottom gravity drain if it was extra pre-ordered as a part of equipment. The heat pump turns off when the air temperature is lower than 5°C. Apart from basic, covering function that protects against pollution and litter, solar foil minimizes heat loss. Thanks to its absorbing properties, the foil accumulates heat from sun rays insulating and heating the water at the same time. Similar situation happens at lower air temperatures, when the foil insulates water temperature from air temperature. Every swimming pool requires suitable doses of chemical agents and a special care of the basin's bottom, walls, water surface and depths using different types of accessories and equipment. The amount of chlorine cannot be higher than 0,6 on a hand tester scale, and water pH should be between 7,2 and 7,6 on the tester scale. The filtration system takes water from the water surface through skimmers. The water with pollution is transported inside the filter and filtered through sand layers. Clean and oxygenated water goes through nozzles back to the basin. After starting the whole pool installation, the filtration device should run EVERY DAY for at least 16 h a day.